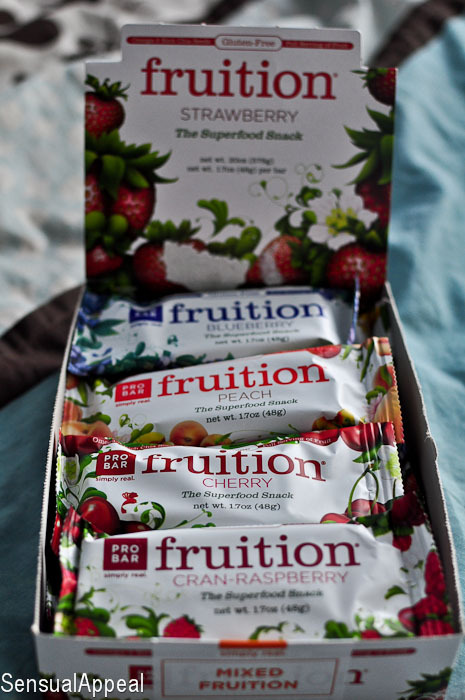 PROBAR Fruition Superfood Snack Review & Giveaway! I have something totally awesome to talk about today with you lovelies. Well, I just got a package full of awesomeness. What, you might ask? It’s the PROBAR Fruition Superfood snacks. Since I’ve been on an energy bar kick lately, this one is perfect. It’s actually much different from any other bars I have tried. This one is a fruit one, rather than the typical cookie/cake/PB ones that you see most commonly. Change is good. It has also recently been awarded the “Healthy Food Award” as packaged foods by Prevention Magazine. Let’s talk more about the bars.. PROBAR has been on a mission to move away from gluten products as much as possible, therefore they introduced a new line of gluten-free bars – Fruition. 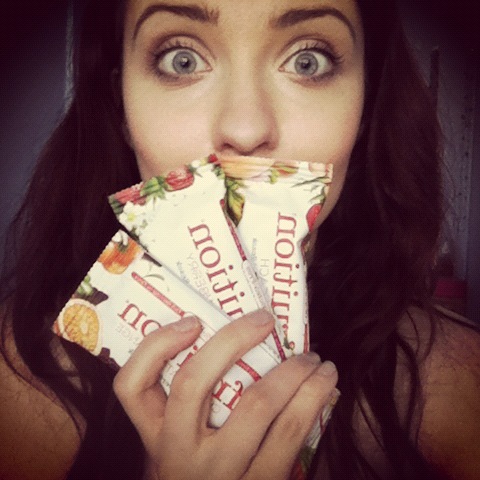 They describe Fruition as a fruit-dense, superfood snack bar (~150 calories). 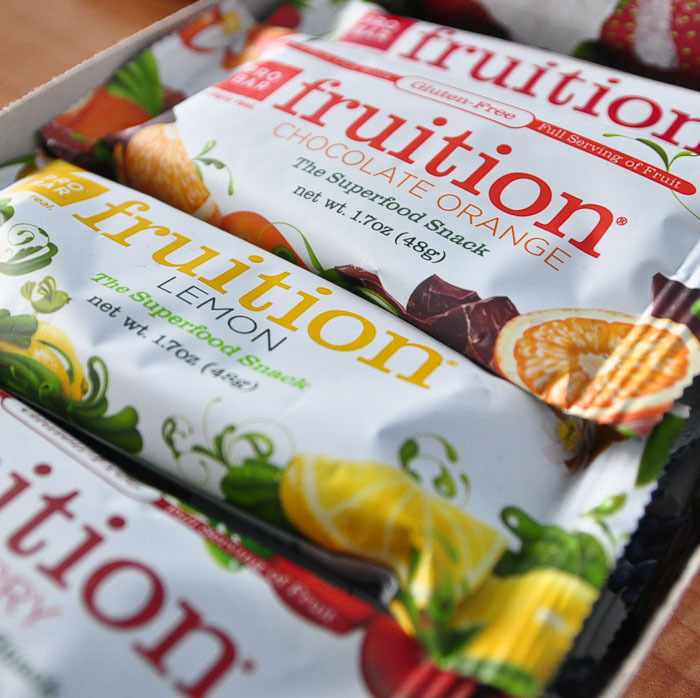 Fruition is designed to deliver 1 serving of fruit in every bar and is built from a 100% vegan, organic, non-GMO, gluten-free medley of dates, oats, chia seeds, and cashews. What’s my opinion of the bars? They are awesome. Upon opening the wrapper you can smell the lovely scent of the fruit. It smells fresh and sweet. The bar itself is chewy, slightly sweet, and light. They nailed these! Now, I know you’re curious and you want to try these babies out for yourself, don’t you? Well, you’re in luck. The giveaway (my first giveaway – how exciting is this?!) contains the exact same package of superfood snacks I received! You will be able to try all of the flavors of Fruition (x2) so you can form your own opinion of the products. Comment on this post saying which flavor you would most like to try. Like PROBAR page on Facebook and leave a comment saying you did so. Like My Page on Facebook and tell me you did so. Follow @xokammie on Twitter and leave your own username in a comment. Subscribe to the RSS or follow through email. Open to all US & Canada residents. Giveaway will stay open until Wednesday, May 9. Winner will be announced on Thursday. Chosen through random.org. 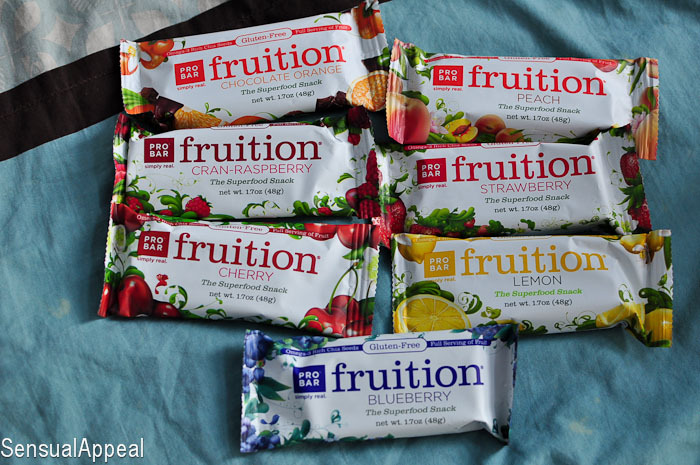 For those of you who don’t win, there’s more: Fruition PROBAR team has been kind enough to provide us with our own one-time discount code! Just go to http://theprobar.com/shop and enter code “BLOGGER” at checkout and you will receive a 40% off discount on your first order 🙂 That’s how confident they are you will like their product! Shared on Fit & Fab Fridays. I would love to try the chocolate orange flavor! Tweeted about the giveaway at (https://twitter.com/#!/officialvsong/status/198401606725808129) Thank you! Lemon lemon lemon lemon. I’m a sucker for anything lemon flavored! Ooh, peach sounds really great! Thanks for visiting my blog! I have heard wonderful things about ProBars! Great giveaway! Raspberry!! Very cool! I want try them all but most if all: lemon! I’m sure I’ll order them too! Yum! I’d love to try the cherry one – cherry things are my favourite! Cherry please! I liked Probar and your FB pages. I am now following on Twitter and tweeted about the giveaway. These look really good! I liked probar page on FB. I would love to try the peach one! chocolate orange def! i want one now haha. I would love to try the strawberry or cherry!! Tweeted your giveaway and I already receive your e-mails. I like PROBAR on Facebook! I just liked you on Facebook too! I tweeted your giveaway link too! I just subscribed to blog’s emails for new posts too! Thanks so much for the healthy giveaway! The Raspberry flavor sounds yummy! I subscribed to your email newsletter too! Thank you so much! The blueberry looks good to me! I’d most like to try Cran-Raspberry!!! I’ve been trying to eat healthier so am curious about these. How many calories are in a bar and are they more like a fruit bar or more like a “granola” style protein bar? That’s sounds like my kind of bar… and a low calorie count as well! I’ve never seen all those flavors! oh my gosh! the peach looks amazing! well they all do!